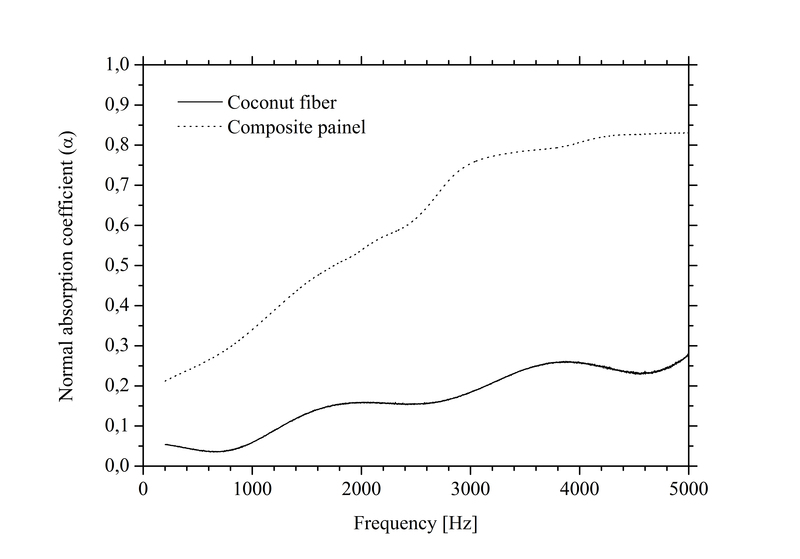 Preliminary evaluation of the sound absorption coefficient of a thin coconut coir fiber panel for automotive applications. Absorbents materials are fibrous or porous and must have the property of being good acoustic dissipaters. Sound propagation causes multiples reflections and friction of the air present in the absorbent medium converting sound energy to thermal energy. The acoustic surface treatment with absorbent material are widely used to reduce the reverberation in enclosed spaces or to increase the sound transmission loss of acoustics panels. In addition, these materials can be applied into acoustics filters with the purpose to increase their efficiencies. The sound absorption depends on the excitation frequency of the sound and it is more effective at high frequencies. Natural fibers such as coconut coir fiber have a great potential to be used like sound absorbent material. As natural fibers are agriculture waste, manufacturing this fiber is a natural product, therefore an economic and interesting option. This work compares the sound absorption coefficient between a thin coconut fiber panel and a composite panel made by fiberglass and expanded polyurethane foam, no-woven woven, and polyester woven, which are used in the automotive industry as a roof trim. The evaluation of sound absorption coefficient was carried out with the impedance tube technique. In 1980, Chung and Blaser evaluated the normal incidence sound absorption coefficient through transfer function method. The standard ASTM E1050-10 and ISO 10534-2 was based in Chung and Blaser’s method, Figure 1. In summary, this method uses an impedance tube with the sound source placed to one end and at another, the absorbent material backed in a rigid wall. The decomposition of the stationary sound wave pattern into forward and backward traveling components is achieved by measuring sound pressures. This evaluating is carried out simultaneously at two spaced locations in the tube’s sidewall where two microphones are located, Figure 1.
where s is the distance between the microphones, x1 is the distance between the farthest microphone and the sample, i is the imaginary unity and k0 is the wave number of the air. In this work, eight samples of coconut fiber and eight samples of composite panel made by fiberglass and expanded polyurethane foam, no-woven woven, and polyester woven used in the automotive industry, Figure 2 and 3. The material properties are shown in Table 1. Figure 3. Composite panel structure. The random noise signal with frequency band between 200 Hz and 5000 Hz was utilized to evaluate a. The Figure 4 shows the mean normal incidence absorption coefficient obtained from the measurements. The results shows that the composite panel have a better sound absorption coefficient than coconut fiber panel. To improve the coconut fiber panel acoustical efficiency it is needed to add some filling material with the same effect of the polyurethane foam of the composite panel. Chung, J. Y. and Blaser D. A. (1980) “ Transfer function method of measuring in-duct acoustic properties – I Theory,” J. Acoust. Soc. Am. 68, 907-913. Chung, J. Y. and Blaser D. A. (1980) “ Transfer function method of measuring in-duct acoustic properties – II Experiment,” J. Acoust. Soc. Am. 68, 913-921. ASTM E1050:2012. “Standard test method for impedance and absorption of acoustical materials using a tube, two microphones and a digital frequency analysis system,” American Society for Testing and Materials, Philadelphia, PA, 2012. ISO 10534-2:1998. “Determination of sound absorption coefficient and impedance in impedance tubes – Part 2: Transfer-function method”, International Organization for Standardization, Geneva, 1998.